The Sony VPL-FHZ55 comes with some "world first" claims that deserve your attention. The first thing to notice, though, is that this is a weighty product, designed for semi-permanent installations in educational and corporate environments and - at 12kg - certainly not for carting between rooms. 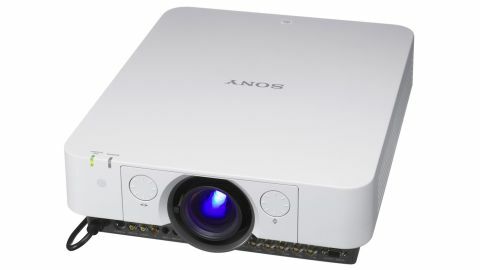 This is the first time we've seen a 3LCD projector - a projection chip technology popularized by Epson and Panasonic - get the lamp-less treatment, with Sony employing a blue laser light source. It's priced at around £7,000 (about US$11,490, AU$12,540) at launch and yet it could have been more expensive. The use of blue lasers keeps the cost of the VPL-FHZ55 down: red or green lasers would have pushed that price northwards. This is a serious projector: seriously bright and seriously long-lasting, and it's that last characteristic that's the reason for the VPL-FHZ55's existence. It's rated to keep on going for 20,000 hours, thereby avoiding the regular expense of replacing burnt out lamps that projectors generally include. This laser beamer is all about easy maintenance. As in, you won't have to do any. It's a lamp-less version of Sony's otherwise similar (though 50% cheaper) VPL-FH36 installation projector launched earlier this year, whose traditional lamp is rated to last just 1,000 hours. Measuring 390 x 148 x 504mm and best positioned on a ceiling, the VPL-FHZ55 is a heavyweight in every way. Ins and outs, positioned either side of the lens on the front of the product, are mind-boggling in scope, though perhaps a tad old fashioned. On the right-hand side is a full set of BNC/component inputs, an RGB D-sub 15-pin slot, DVI-D, monitor output and an HDMI input. On the opposite side is S-video, composite video, various analogue audio ins and outs, an RS-232C control jack (beloved of Crestron control systems, among others), the DC inlet, and wired LAN. There is no Wi-Fi on the VPL-FHZ55, though it can be networked. The VPL-FHZ55's resolution is a beyond HD WUXGA 1,920 x 1,200 pixels, though it's technically possible to get even higher: if you can afford two projectors you can engage an Edge Blend feature and create a side-by-side 3,840 x 1,200 pixel image. Those after 4K should save up a few more pennies and head for Sony's SRX-T105, SRX-T110, SRX-T420 or VPLGT100 projectors, all of which rely on the company's own SXRD (Silicon X-tal Reflective display) tech. The brighter SXRD tech has, however, been left out here partly to bring down the price, although the fact that there are fewer pixels to illuminate also means it's not crucial. Sony has opted for latest-gen 3LCD panels rather than SXRD or the DLP color wheels that normally accompany laser light sources on projectors. No matter: the VPL-FHZ55 is all about brightness. The laser lamp is rated at 4,000 Lumens, though that's on high power mode. 3,000 Lumens is its average rating. World firsts or not, the VPL-FHZ55 ought to be judged solely on its ease of installation and its picture quality. And the first thing to say is that the VPL-FHZ55 needs some room. To fill our 80-inch test screen we had to place the VPL-FHZ55 about 3.5m away (throw ratio is 1.39:2.23). The remote's three central buttons - focus, zoom and shift - are redundant and have no function, likewise a large digital zoom rocker, though the manual controls provided are thankfully sufficient. Using a combination of the VPL-FHZ55's two adjustable feet on its undercarriage, a manual zoom (x1.6) lever, two lens shift toggles and a manual focus ring, we got the image spot-on. Those vertical and horizontal lens shifters are massively important since they allow the projector to be placed a long way off-center to the screen, but they are a tad jerky. An automatic keystone feature would have been handy, too. The brightest picture mode on the VPL-FHZ55 is the Dynamic setting, which is best suited to giving presentations in lots of ambient light. Much brighter than hybrid DLP/laser projectors we've used, the images are nevertheless well balanced, with plenty of contrast and color. Text looks crisp, and complex graphics in PowerPoint files are clear without being a strain on your eyes. Turn to the Standard setting and the curtains and blind are best closed, but the VPL-FHZ55 tones down color and brightness well to give The Amazing Spider-Man a decent enough look. Fast-moving scenes are reasonably smooth while there's just enough shadow detail in black areas of the image. The contrast, brightness, color, hue, sharpness and color temperature can be adjusted, though the "expert settings" only amount to a lone black level adjuster. The lens shift pads in particular make the VPL-FHZ55 reasonably easy to install, while the sheer number of ins and outs is impressive. Images are excellent. The extra brightness is delivered subtly, but it makes a big difference. Simple to operate, the almost instant on/off capability of the VPL-FHZ55 will also prove handy. Considering its size, its operating noise of 49 decibels, peaking at 58 decibels, is actually pretty impressive. A highly technical world first or not, shouldn't a projector costing this much be slightly more installation-friendly? Should it not have its own chassis and purpose-made remote, instead of one with several redundant buttons? And oughtn't there be some apps and drivers that allows wireless connection of mobile devices and laptops? Although a USB slot would be lost on those installing the VPL-FHZ55 on a ceiling, we'd still like to see one. Those lens shift levels, though a great feature, are fairly jerky and don't lend themselves all that well to getting a truly exact image. While it's the lack of lamp changes that will tempt many corporate buyers, the VPL-FHZ55 will delight as a semi-permanent installation projector. Its plethora of ins and outs, as well as some all-important lens shift dials, make it reasonably simple to install, and there's little complexity in the on-screen menus. Some will miss the kinds of connected features becoming common on data projectors, such as a Wi-Fi Direct, apps for mobile devices, media reading software and built-in flash storage. They probably should be included here to add extra flexibility, and so should a remote control actually built to partner the VPL-FHZ55, but as a powerful projector that needs little or no maintenance, this laser light box makes an excellent choice.